The clear and urgent need for churches of every size in any community to plan and effectively carry out a Church Security Ministry plan was placed squarely in front of every pastor by the latest and most horrific church shooting in our history on November 5, 2017 at First Baptist Church in Sutherland Springs, Texas. The vulnerability every pastor and parishioner in small to midsize churches everywhere immediately felt must be met with a resolute commitment that the church of Jesus Christ will never yield to fear, cower within our wall or stop doing the work of spreading the gospel and making disciples. Texas Pastor Council has led the way in working closely with law enforcement and government officials over the years as a central part of our mission to unite pastors and engage our culture for Christ. 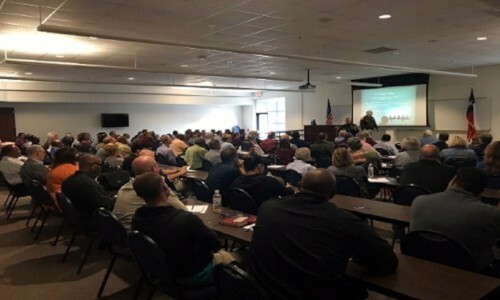 It was natural for us to immediately connect with those leaders and begin conducting Church Security Workshops beginning in Southeast Texas, with over 300 pastors and church leaders participating to date. We are establishing a Church Security section of our website that will continue to be constantly expanded, and will be reaching out to our lead pastors in every community around the state to “connect the dots” between spiritual confusion, moral anarchy, the laws of our land and God’s purpose of civil government as all parts of this dilemma to which we are charged with bringing redemption in Jesus’ name!